Posted on January 9, 2018 at 7:10 pm. Girls Just Want To Have Fun– and so do boys… Sometimes we just get goofy in the classroom. Your children can count to ten in 15 different languages (English, Latin, Sign Language, Spanish, French, German, Greek, Japanese, Arabic with the Lebanese dialect, Italian, Russian, Romanian, Swedish, Tagolog, Hebrew, and Korean). 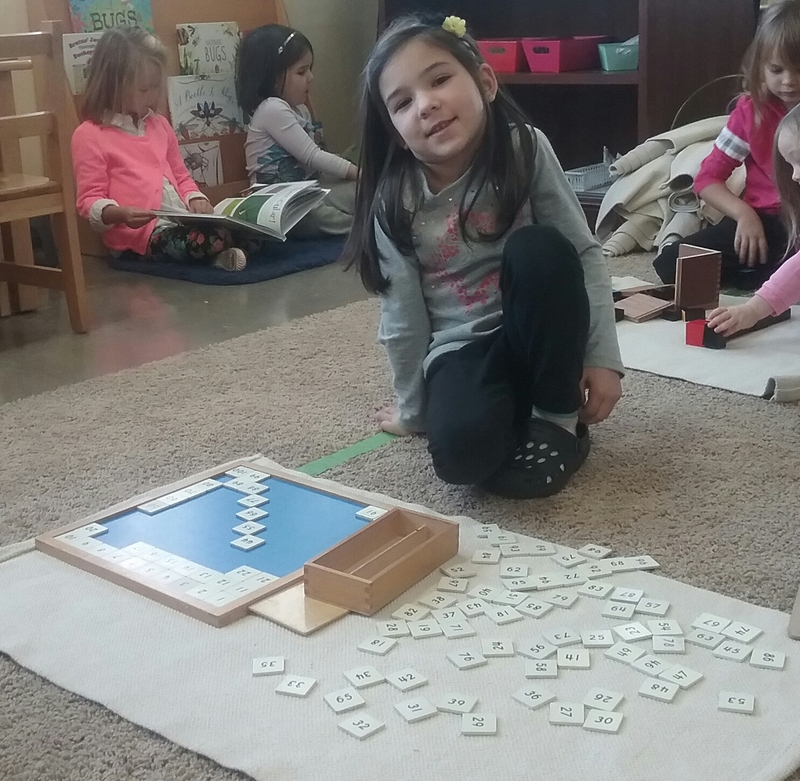 A Montessori Classroom has students ranging from 2.5 to 6 years of age. 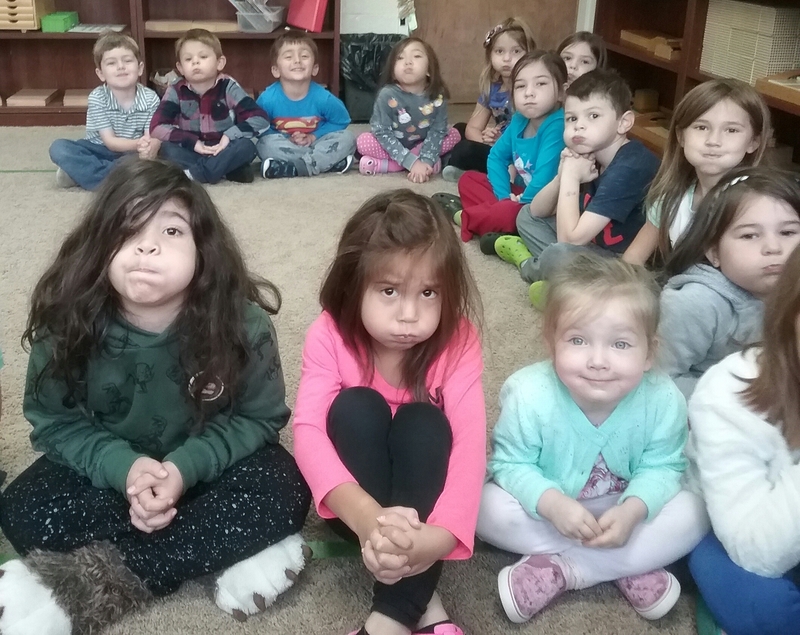 Here are the newest 5 year old students. 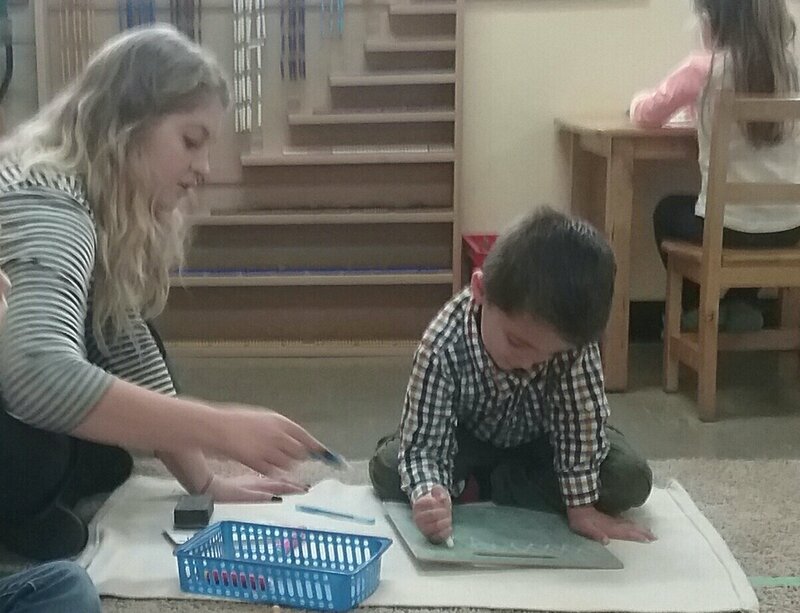 Doing Chores in the Montessori Classroom is a staple activity. 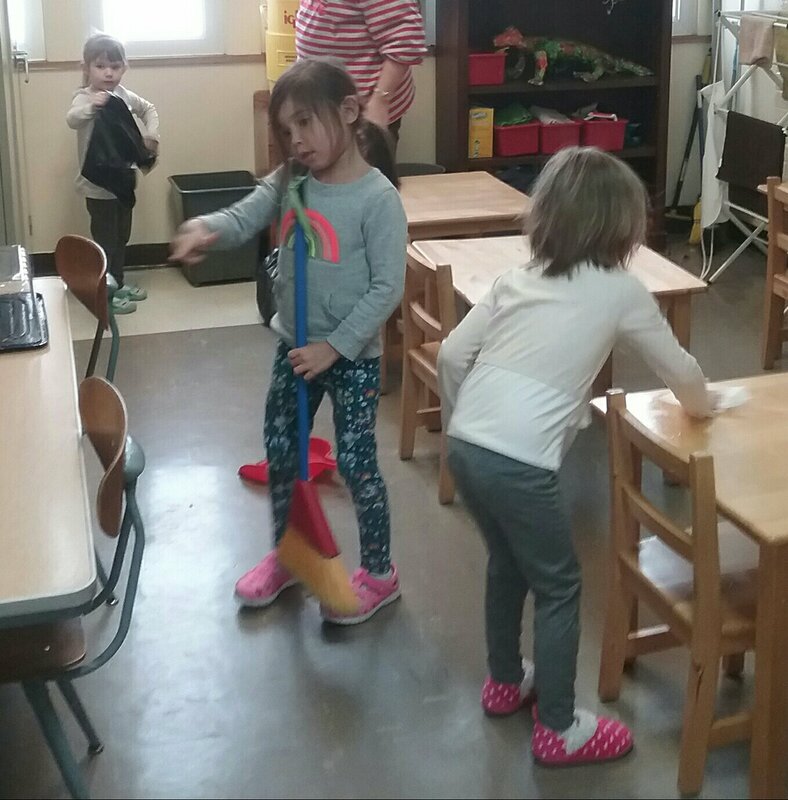 Here you can see students emptying the trash, sweeping the floor, and wiping the table tops. 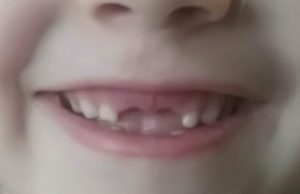 Everyday a child is given a different task to do. 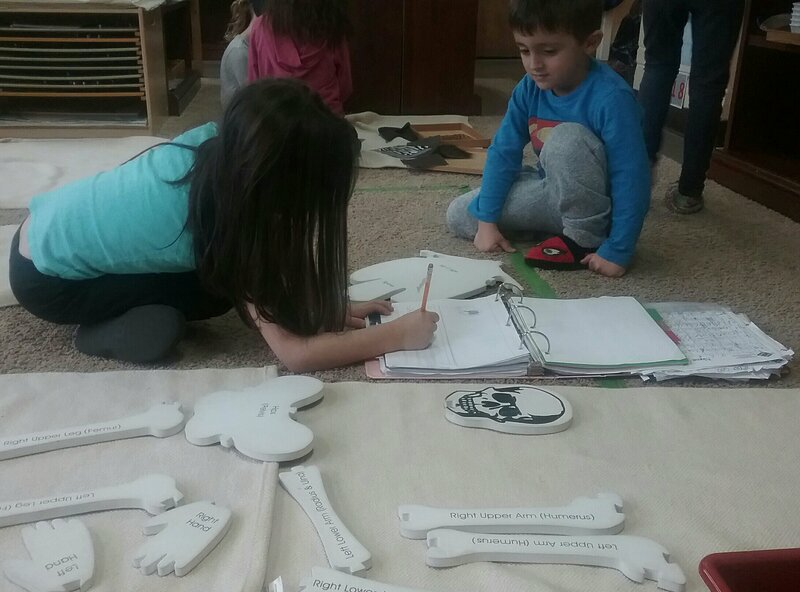 Doing chores helps the child enhance focus and confidence, gives them a sense of accomplishment, gives them self-reliance and purpose, increases empathy by learning to be responsive to others’ needs, instills a work ethic, and improves a sense of belonging. This student is working on equations with the Stamp Game. The Stamp Game is a tool for learning and reinforcing knowledge of the four maths operations: addition, subtraction, multiplication and division. It is just more abstract, yet concretely demonstrates the maths process to students that are ready for this material. 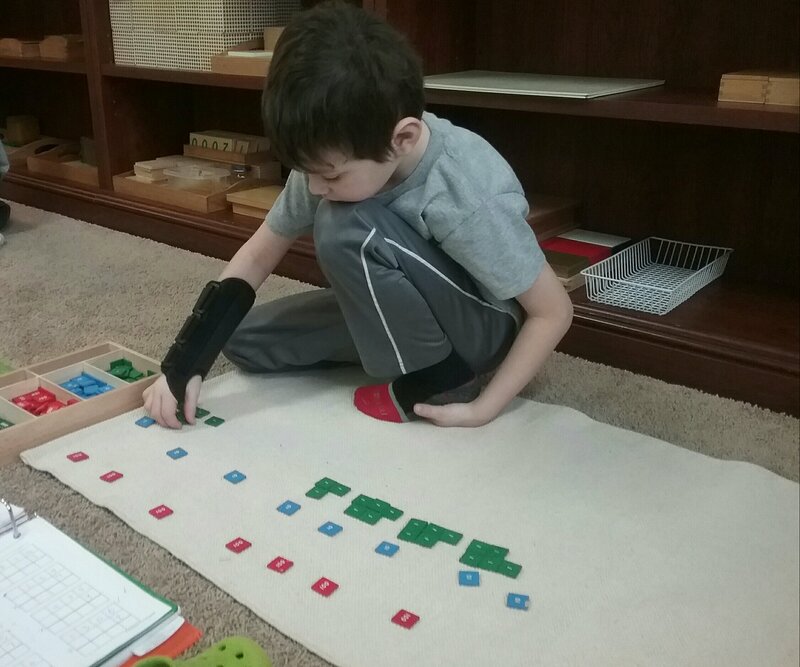 This student is working on equations of multiplication, with multiple carry overs in all columns. For example 654 x 6. 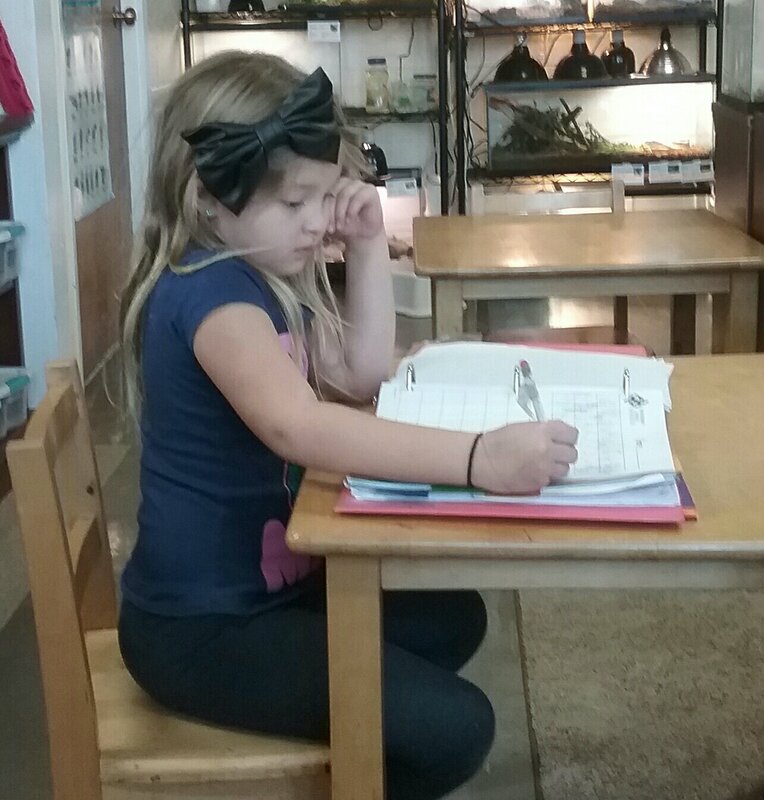 This student is working on one of my Science Boxes (frogs and toads). 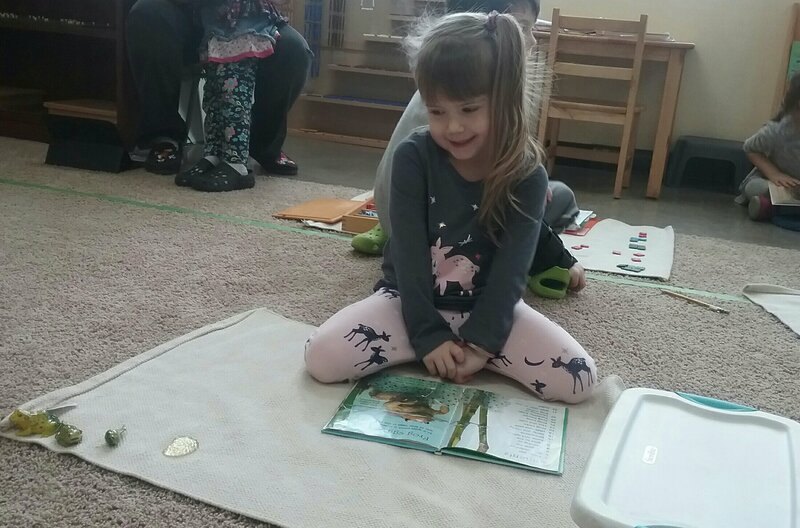 She is reading a book on frogs and toads and has four pieces Jelly eggs, tadpole, froglet, and frog. She puts them in order to reinforce the life cycle of a frog/toad. Here are two friends working on the sandpaper numbers. 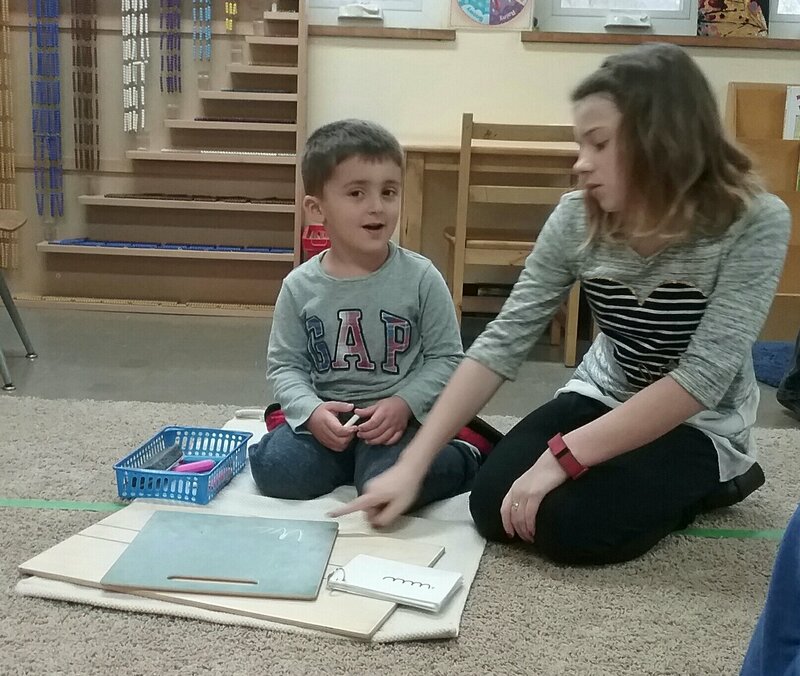 The aims of sandpaper numbers are to give the child a sensorial impression of the form of the symbol. 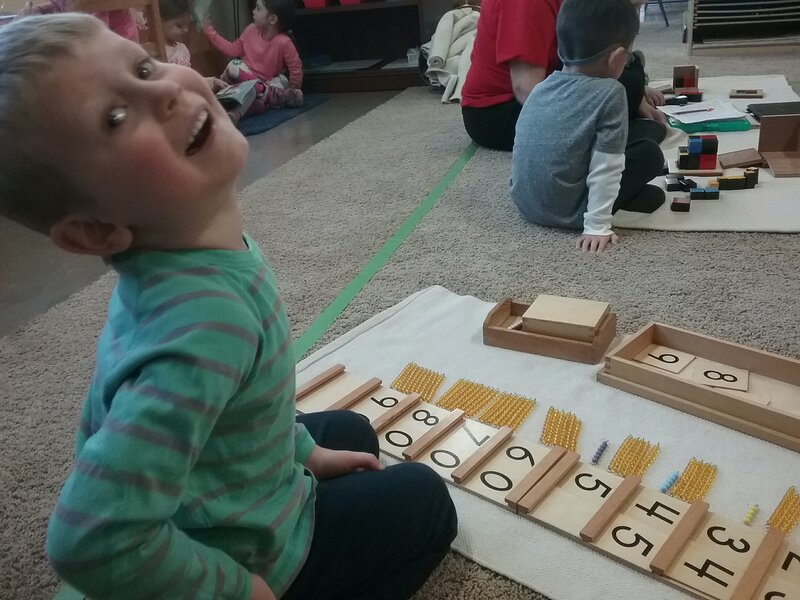 To show the succession of numbers. To show base 10 Recognition of numerals 0-9 Preparation for writing numbers. Posted on January 4, 2018 at 4:45 pm. Posted on December 18, 2017 at 7:26 pm. 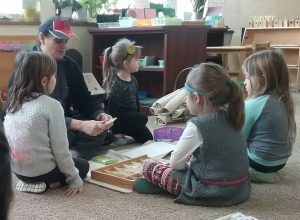 A Montessori classroom hast students aging from 2 1/2 to 6 years of age. These are my two newest six year old students. I just wanted to say your children did a great job at the Christmas Show!!!! Those two songs they sung were very difficult pieces to sing. The church I attend has an extremely accomplished music program and the Men’s, Women’s, Children’s (age 8 to voice changing for boys) sing these songs on Christmas Eve to a packed house. Very seasoned choristers that practice five hours a week. I wanted to do something different and the set up for this year’s show gave me that opportunity. I felt these Carols were very beautiful songs and the students would be more than qualified to pull it off. The soloists that did Past 3 O’ Clock did a very fine job. My daughter, niece, and nephew were all soloists for this song at age 12, my youngest son did it at age 9. 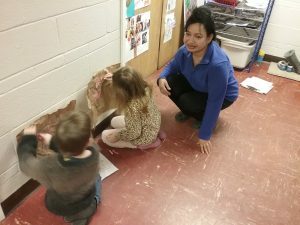 I was so impressed the two 6 year old students did so well. I do want to thank all of the staff involved from teachers practicing with the children to the office staff securing the location to mapping out EVERYTHING that needed to be done. Of course, I wanted to thank the parents for everything you did including taking your children to the restroom before the show. The Absorbent Minds Montessori School Family is truly a special one. Start bringing in the family trees. Posted on December 13, 2017 at 2:50 pm. 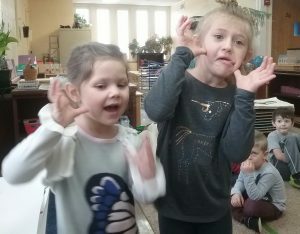 We kept practicing for The Christmas Show and learned about Christmas traditions from around the world. 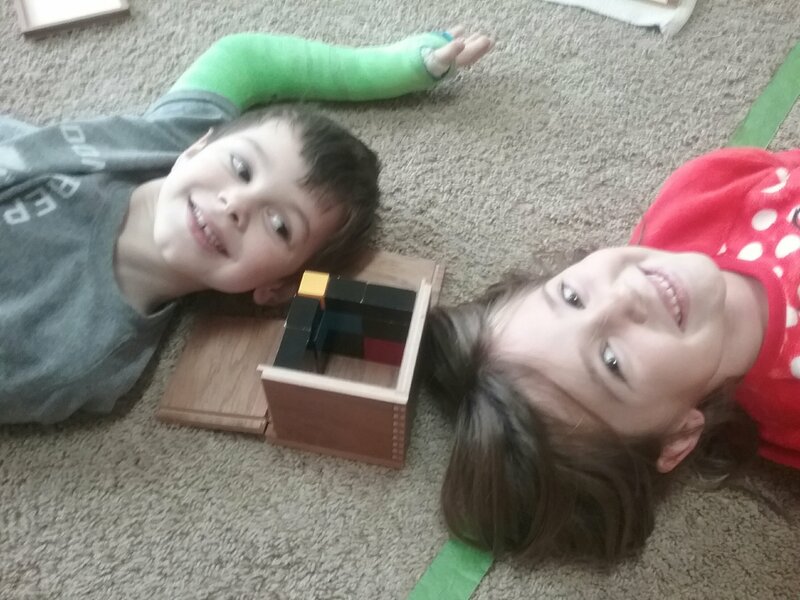 These students are having fun with the Trimonial Cube. As you can see they just did the outer wall of this material. This is another extension that the children can create different versions of materials. 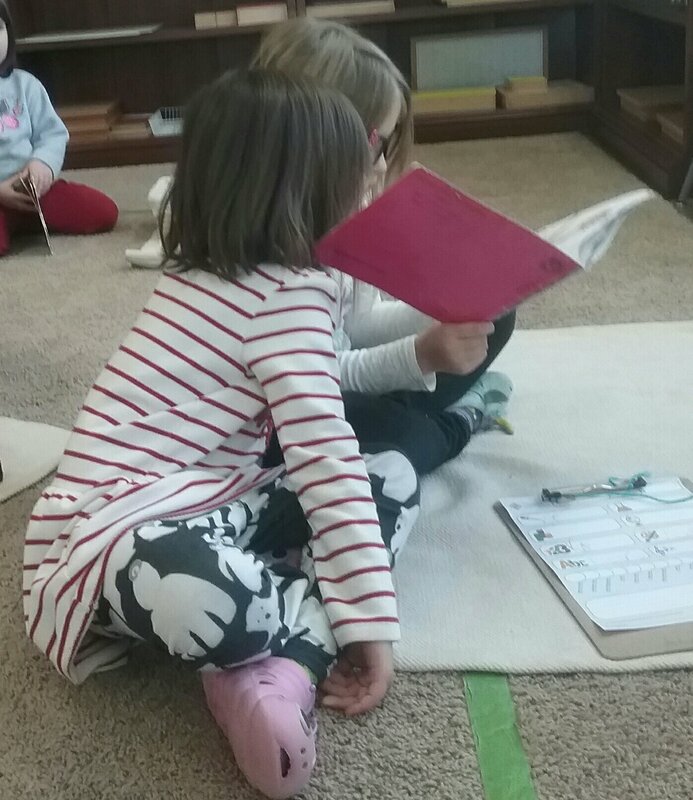 This picture depicts a seasoned reader reading to a younger student. My readers have to accomplish two things before mastering a book. 1) read the story fluently and 2) give details of the story. I start out with reading the Hooked On Phonics books then the students graduate to my “Max” books. When those are mastered I introduce chapter books such as Magic Tree House, Billy B Brown and / or Jack books. The direct purpose of the sandpaper letters is to teach the child the sounds of the alphabet by means of auditory, muscular, and visual memory. 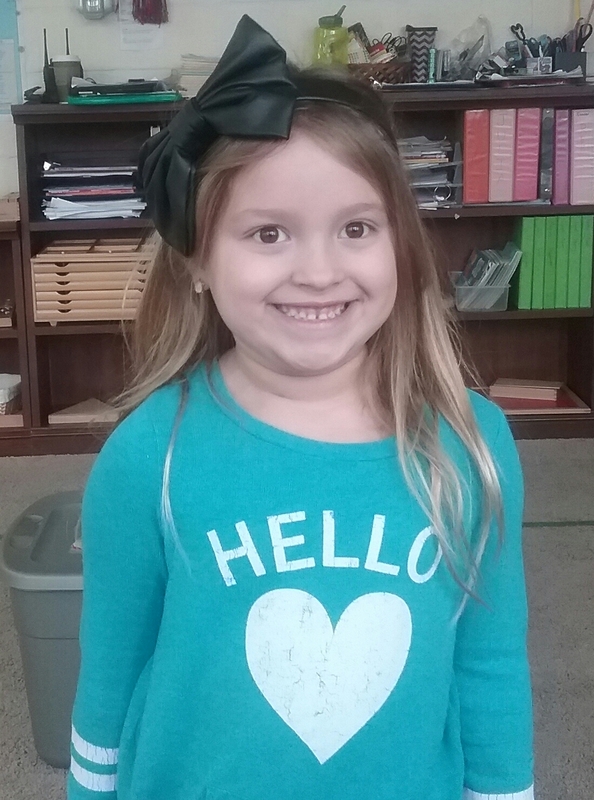 Also, memorization of letter sounds plays a part in learning the letter sounds. We will still be focusing on the holiday season. 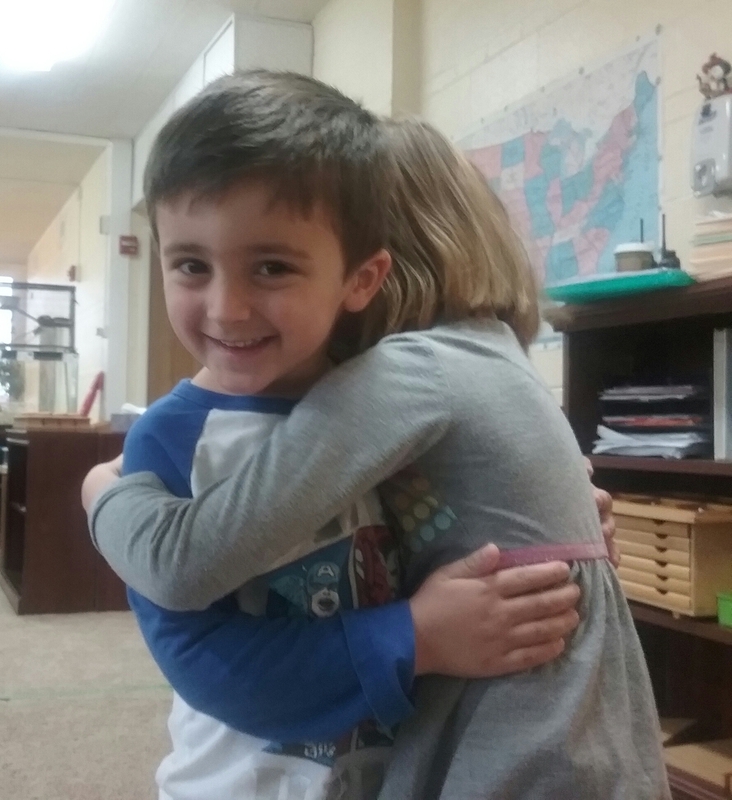 Students will need snowpants, winter coats, hats, gloves, and boots to go outside for recess. Posted on December 8, 2017 at 3:58 pm. 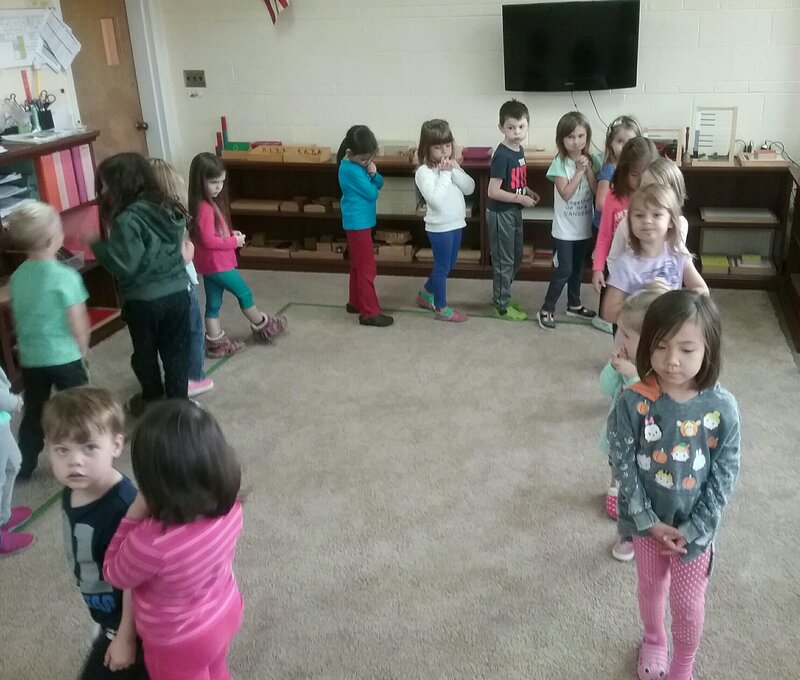 Your children are busy little carolers practicing for the Christmas Show. 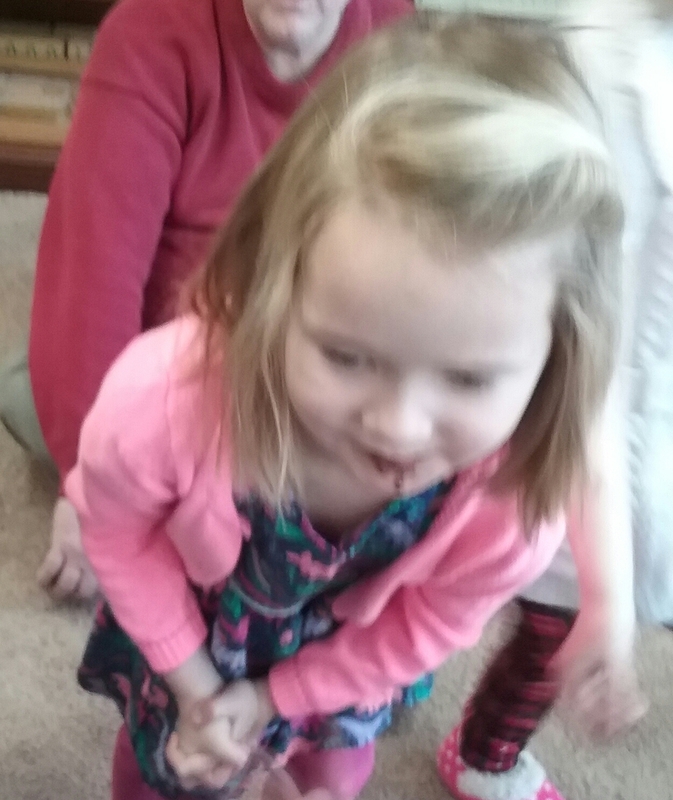 We also leaned a few fun traditions of Christmas around the world. 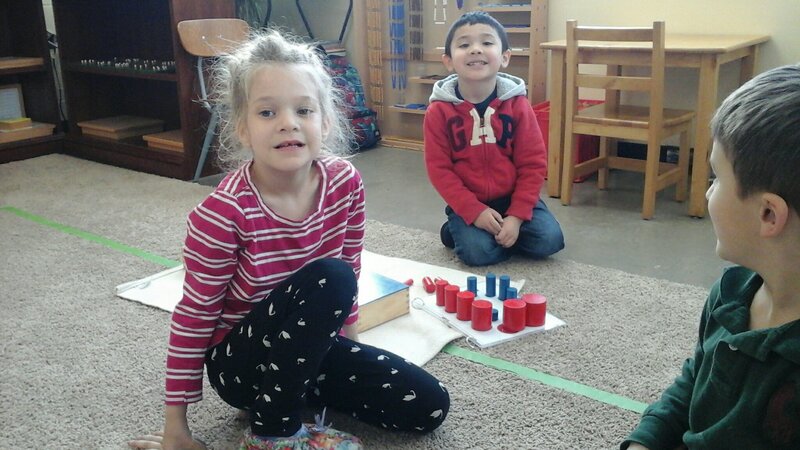 The Montessori classroom consists of 2 1/2 year old students to 6 year old students. 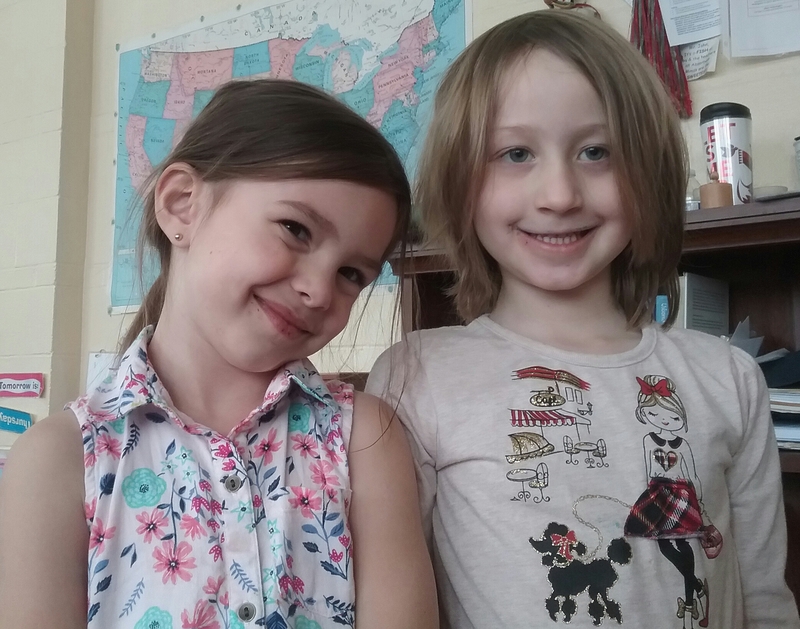 Meet our newest 5 and 6 year old students. This is a lunchtime scene. Every student scheduled in the morning is included with lunch. This is new this year and a great change to the schedule. Lunch is a time for socialization. Lunchtime has three main purposes which are socialization, table manners, and time management. The first two are self explanatory but time management may need an explanation. 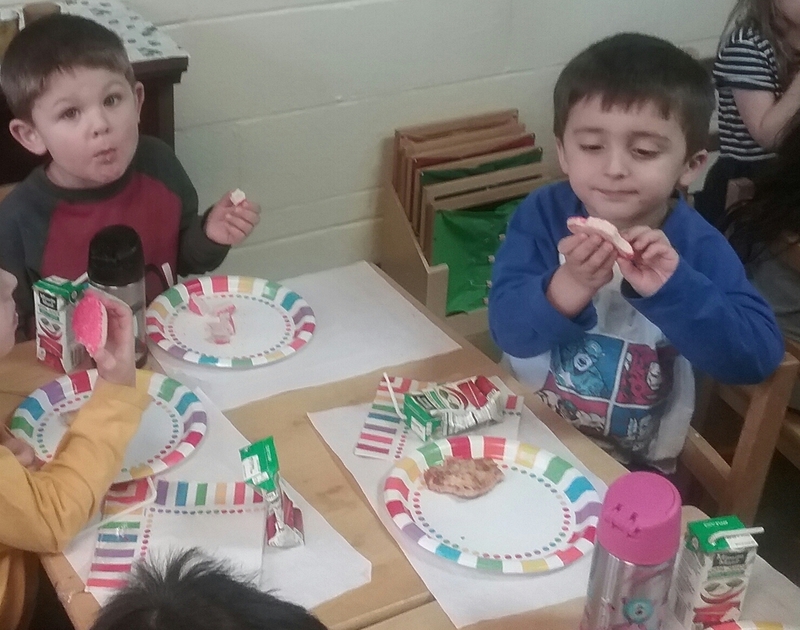 Time management includes time for socialization and eating their lunch. 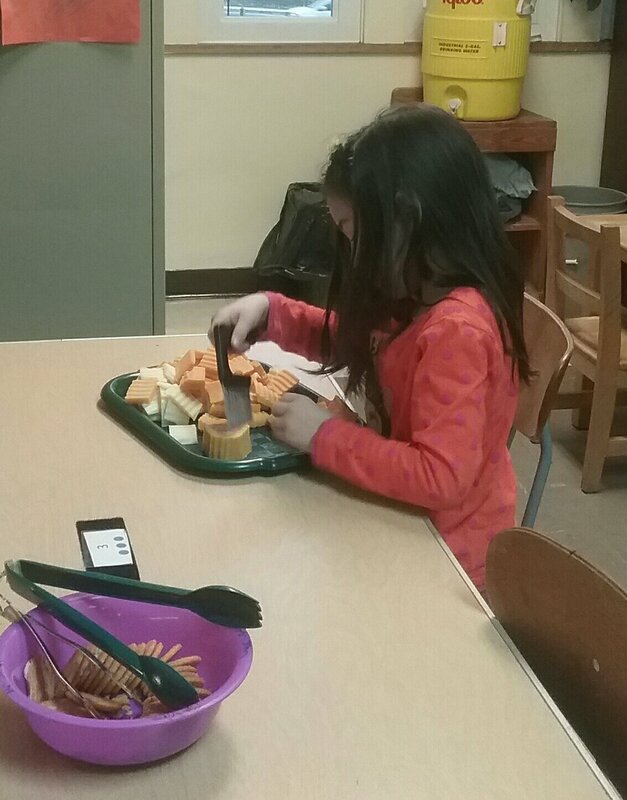 Also, the student has to manage eating healthy food before treats. 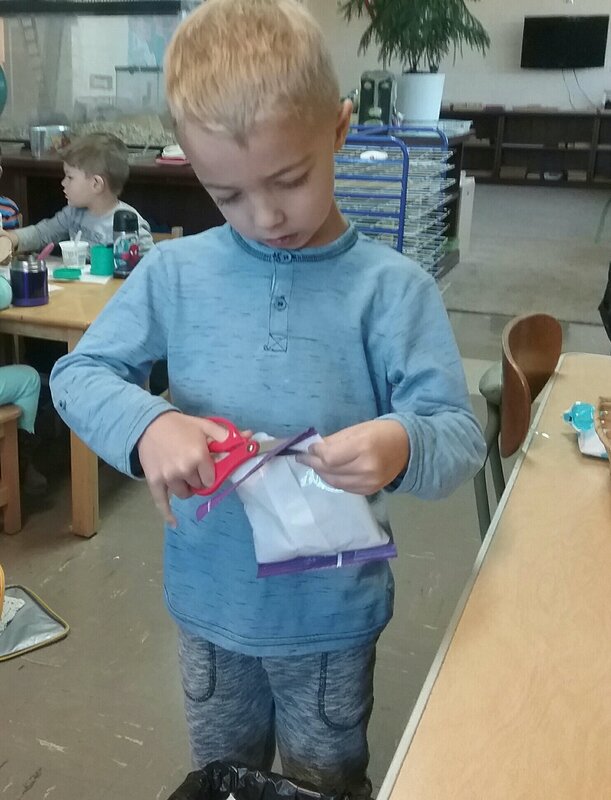 Another picture from lunch is a student opening a bag. 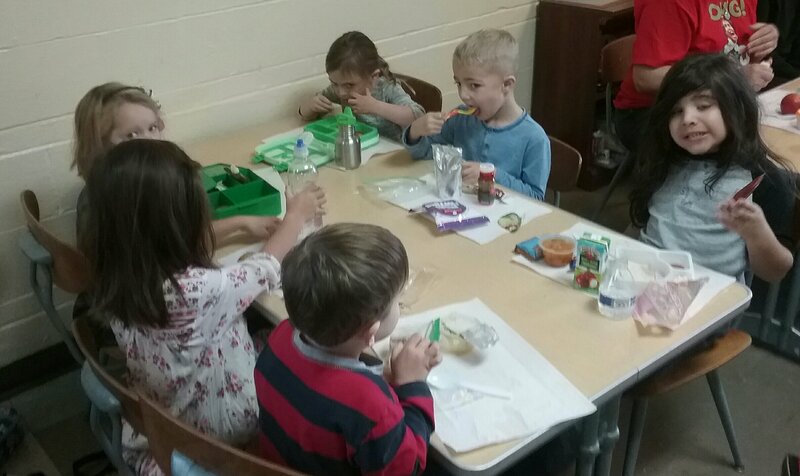 We encourage students to be self sufficient when opening bags, bottles of water, or string cheese. If the student is unable we ask them to go to three students before a teacher. “Three before me” is what the teachers tell the students. This work is a creation made from the red rods found in the sensorial area and the number rods which is found in the Math area. As you can tell the biggest rods on the bottom and the smallest towards the top to create a square based pyramid. Notice the square based pyramid that is part of the material called the geometric solids (which are three dimensional shapes) on top of this creation. The students found the relationship once again. 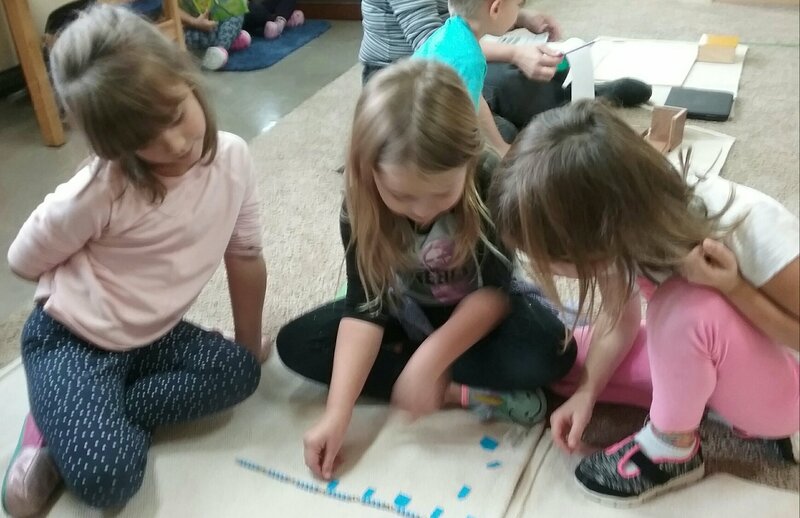 These students are working on the bead chains which the main purpose is linear counting and skip counting. In addition to linear counting, the bead cabinet provides a concrete representation of abstract mathematical concepts. While children at this age are not able to verbalize these concepts, they can represent them. 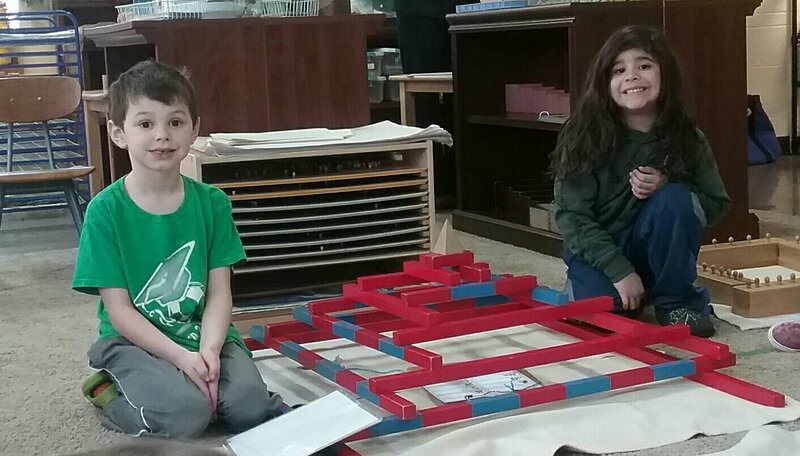 Through the use of the bead chains, number squares and cubes, and numeral arrows, the bead cabinet concretely demonstrates: skip counting — 10, 20, 30, 40, . . . 1000, multiples, squared numbers: six 6s = 36 , cubed numbers: ten 100-squares = a thousand cube. Practicing for the Christmas Show and learning about Christmas around the world. Posted on November 29, 2017 at 2:07 pm. ‘Tis the season for the Christmas Show practices. We started to practice and will be practicing for the next few weeks. 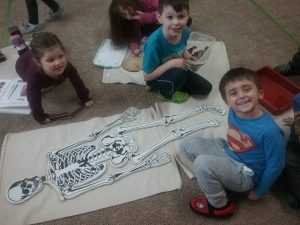 My class is trying something a little different this year. We are going in the “Way Back Machine” to Merry Old England and performing two traditional carols. They are a bit different in melody but I know our extraordinary students will be able to pull it off. 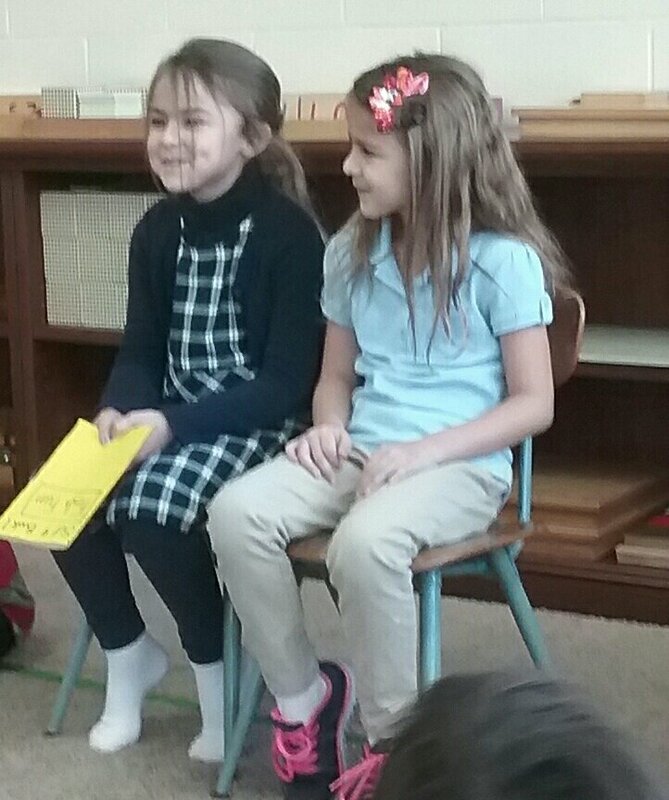 We had a pair of alumni come in to visit, read, and tell our students about their experience at their new school. You’re not seeing double they are twins. This student is working on one of her her assignments in her kindergarten binder. She is working on her 100 page. This where she writes from 1 to 100. Then 101 to 200 and so on. 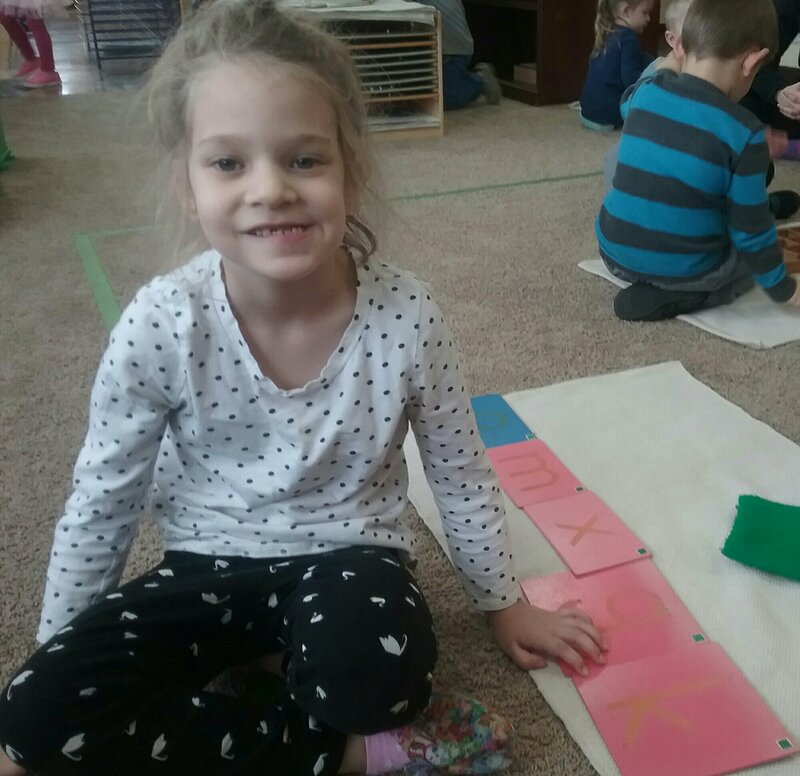 This develops her concentration, betters her handwriting, and helps her recognize patterns. 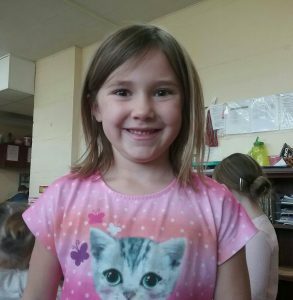 This student is working with money. 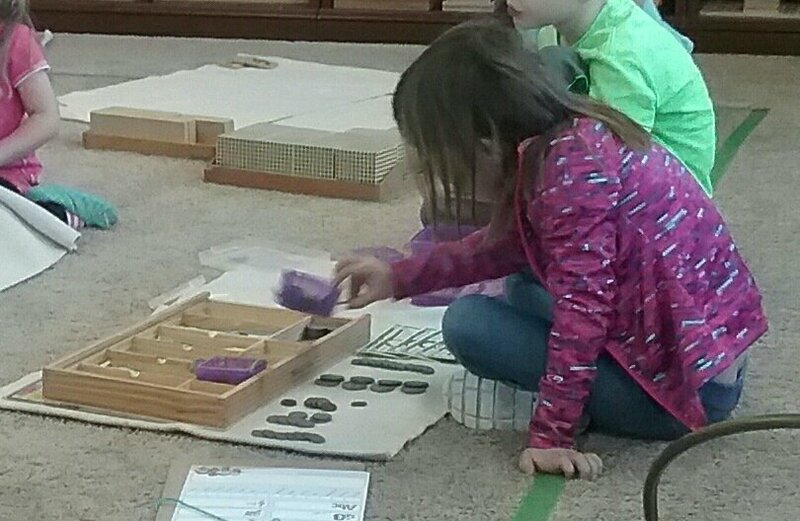 She already knows the value of each coin and now she is counting change. She is also familiar with “paper money”. 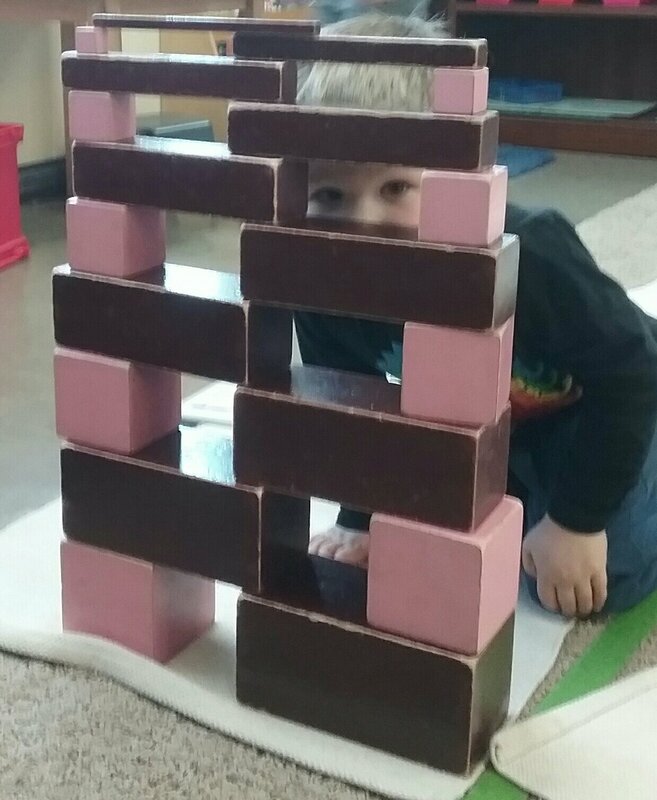 We have discussed the visual discrimination of the Pink Tower and Brown Stairs but this child has found the relationship between the two materials. Students will match the corresponding pieces of these material. This student did match the the corresponding pieces but he took it to another level and made this creation. 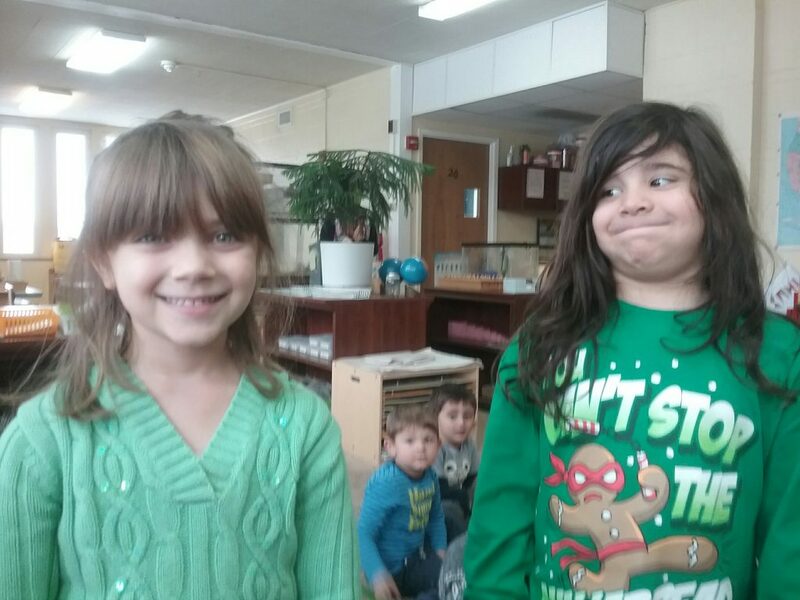 Christmas show practice and we will learn about different Christmas Traditions from around the world. Posted on November 13, 2017 at 2:56 pm. 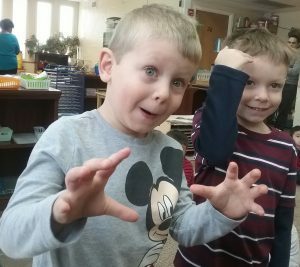 We traveled back in time and discovered some fascinating things about certain dinosaurs. 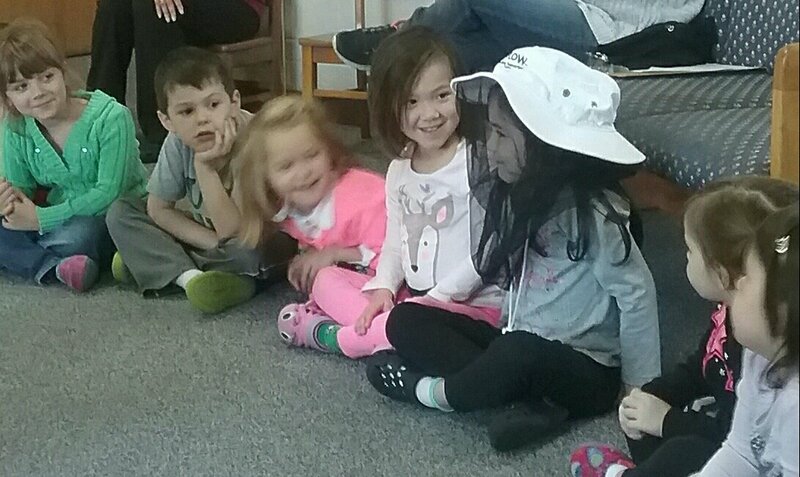 We learned that dinosaurs no longer exist and that they are extinct. We know dinosaurs exist because scientist found their bones or fossils. From these fossil we saw that some teeth were long and sharp to tear flesh from it’s prey which belonged to meat eaters or carnivores (T Rex). Some teeth were flat for grinding plants, leaves, and branches and belonged to plant eaters or herbivores (Brachiosauras). 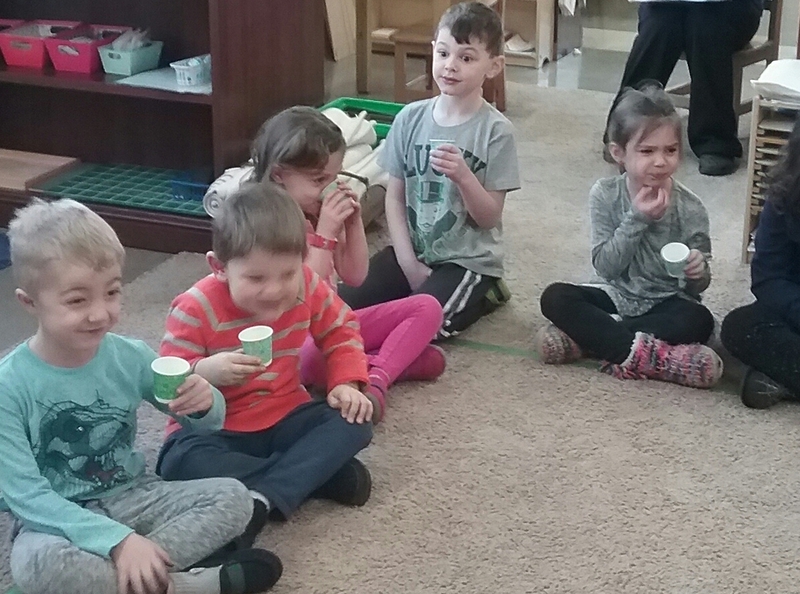 We can now count to ten in 13 different languages (English, Sign Language, Latin, Spanish, German, French, Greek, Japanese, Arabic with the Lebanese Dialect, Italian, Russian, Romanian, Swedish, Tagalog, and Hebrew). 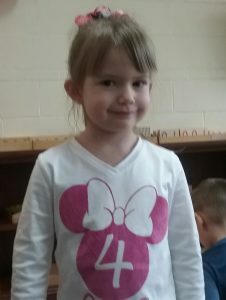 We had an alumnus come in on her day off from school. She is in the 6th grade and came in to read to our class and help with lessons. I asked why she came back to her old school and she told me she had such a great experience she wanted to come back and give back to the school. Her words not mine. Metal Insets are a popular material found in the Language area. This work has many purposes. The main purpose is to prepare the child for handwriting and improve the fine motor skills. Also, it introduces the child to Geometry and the names of a variety of shapes. The chalk board is found in the Language area. The main purpose, obviously, is the introduction to handwriting. I like my students using chalk because most like the feel and can erase if a mistake is made. After my classroom students may not have an opportunity to use chalk. 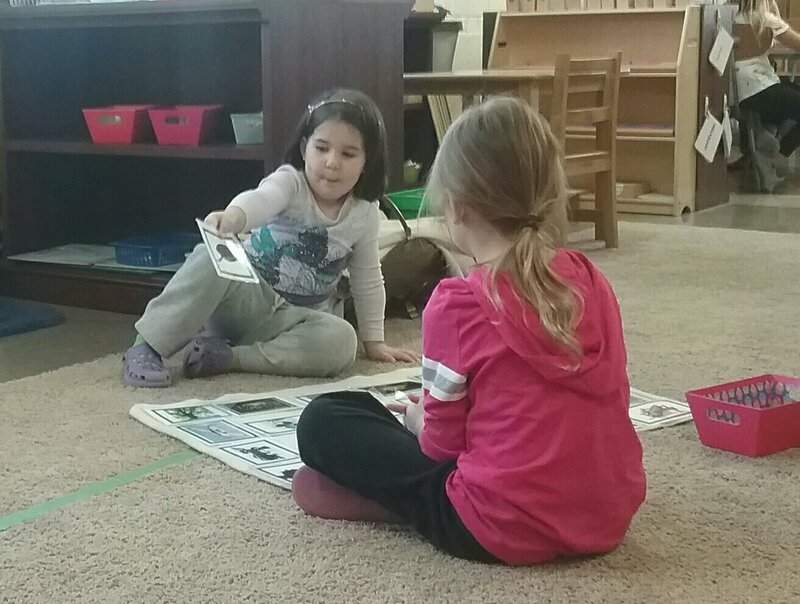 This student is getting a lesson from our University of Akron field student. The students are drawn to this material that are photographs of familiar objects and the become aware of the relationships between things. We discuss the associations and point out other examples in the everyday world. This increases the child’s experience and vocabulary. The 100 board simply a board with 100 squares (10 x 10 squares), that come with 100 number tiles that fit nicely. 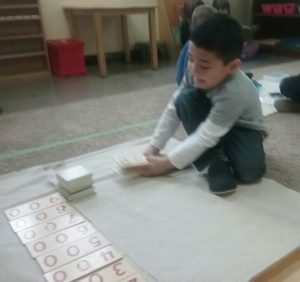 The Hundred Board is useful for number recognition, number sequencing, counting, patterning, possibly skip counting (depending on your method) most of all it’s perfect for just reinforcing the understanding of numbers from one to one-hundred. Notice this child is not only placing the numbers in order but she is randomly finding where the tiles go. 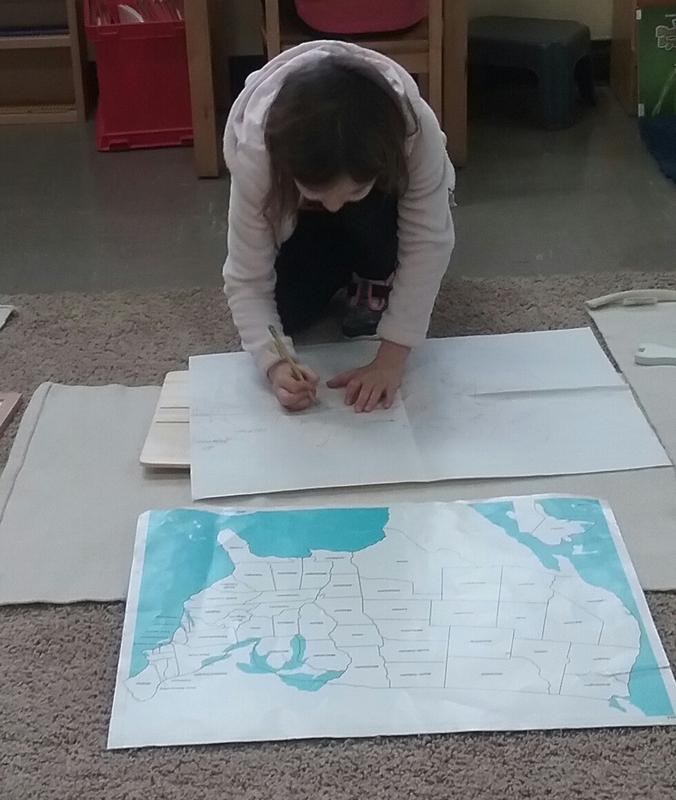 She has identified the pattern of this work. Posted on November 9, 2017 at 12:40 pm. 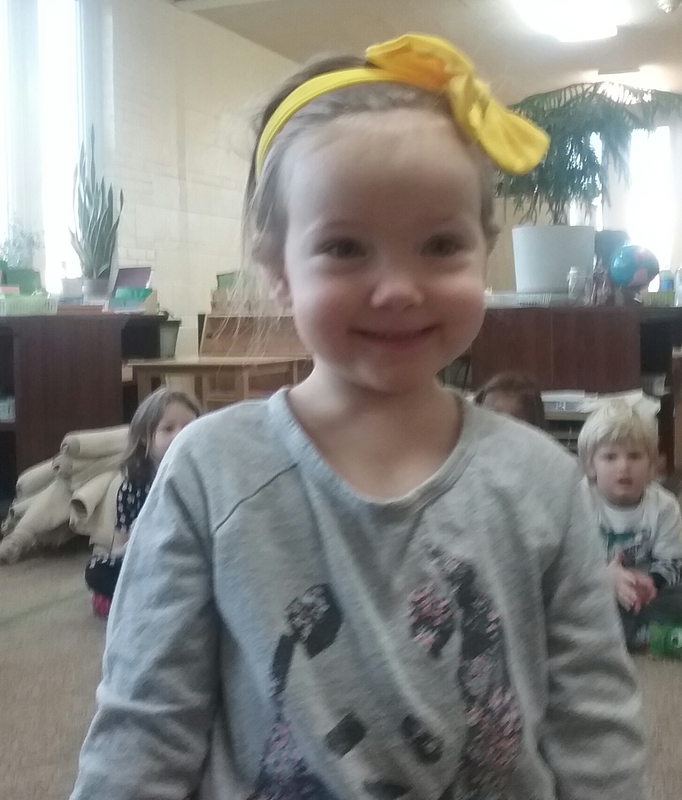 This week we creeped and crawled and learned about insects, arachnids, and invertebrates. 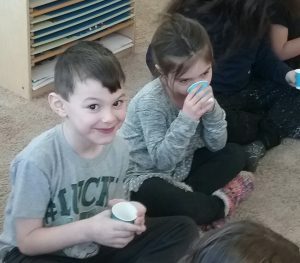 We first looked at insects. The characteristics of an insect are they have three body parts, head, thorax, abdomen. The also have six legs and two antennae. We sang the song “Head, Thorax, Abdomen” to the tune of Head , Shoulders, Knees, and Toes. 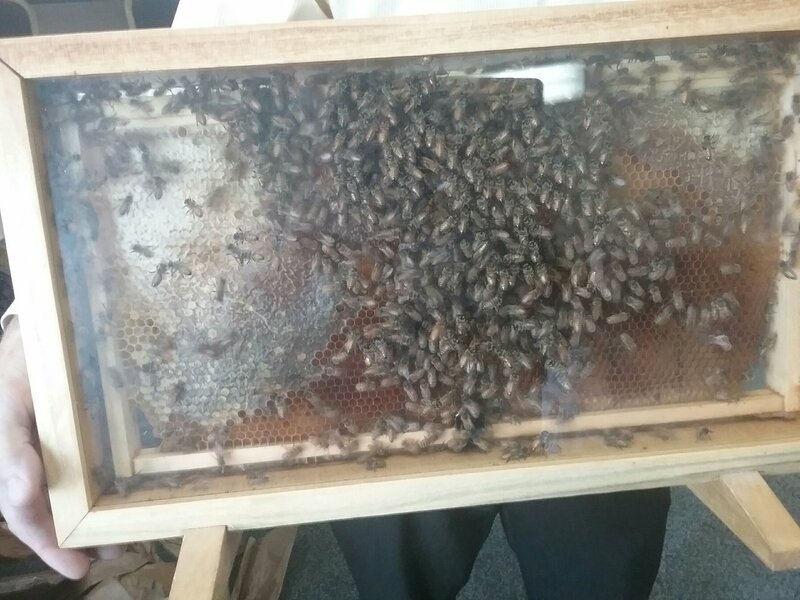 Some examples of insects were ants and crickets which can be found, enclosed not free, in the classroom. Also, the mantis, bees, butterflies, and dragonflies. Arachnids are eight legged creatures that have a head and a thorax. Some creatures that are arachnids are spiders (tarantula named Charlotte) that is in the classroom, scorpions, and the tick. Both creepy crawlers are invertebrates which means they do not have a backbone or a spine or a bony skeleton but actually have an exoskeleton. An exoskeleton is is the external skeleton that supports and protects an animal’s body. Other invertebrates are earthworms, jellyfish, and crawfish. We can now count to ten in 13 different languages (English, Sign Language, Latin, Spanish, German, French, Greek, Japanese, Arabic with the Lebanese Dialect, Italian, Russian, Romanian, and Swedish). 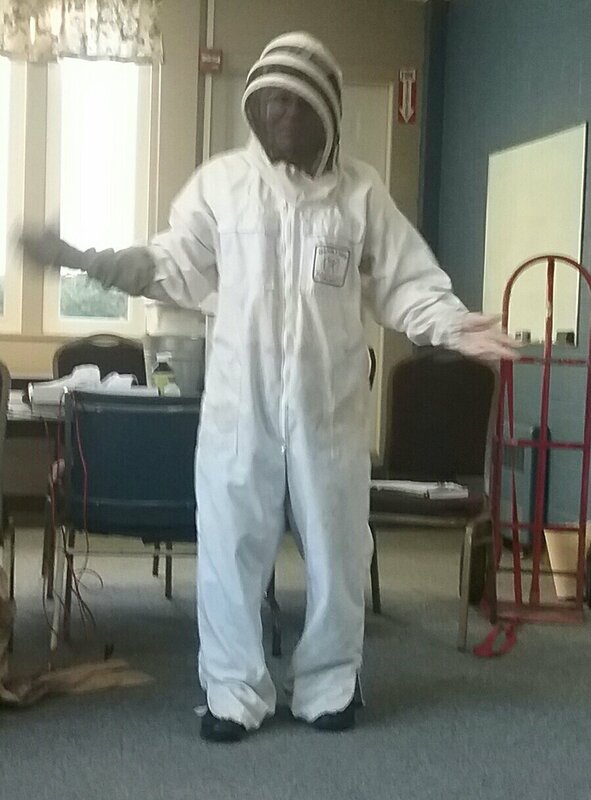 Pastor Kirk has several bee hives and talked about bees and brought in his equipment. The children tried on a protective mask, touched (an empty) hive with wax, and saw real live bees (in an enclosed hive). We’re a happy family. The babies are growing, mom is doing well, and the aunties are accepting the litter. 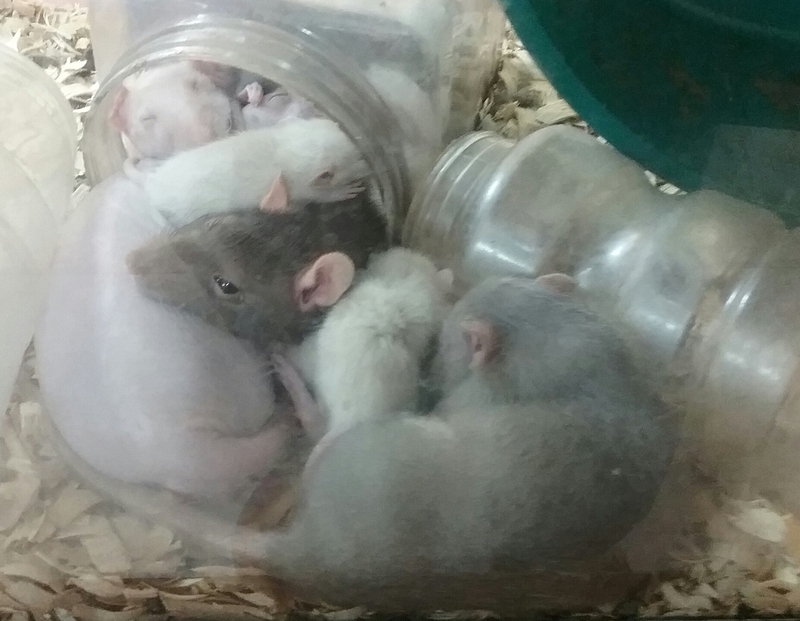 Anyone want pet rats???? 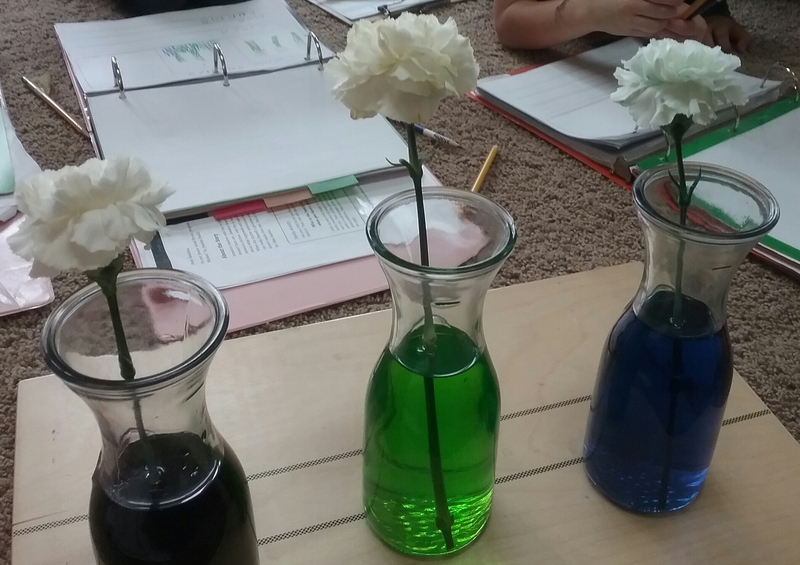 The old colored water with with flower experiment. As you can see we chose dark purple (which did nothing to the flower), green (which turned the flower yellow), and blue (which turned the flower blue). 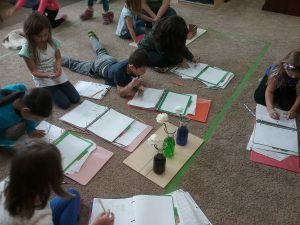 My kindergarten students tracked the color changes in their personal binders. We came up with possible reasons why the purple did nothing. We thought maybe too much coloring couldn’t get up the stem. The yellow maybe had more yellow in the coloring. 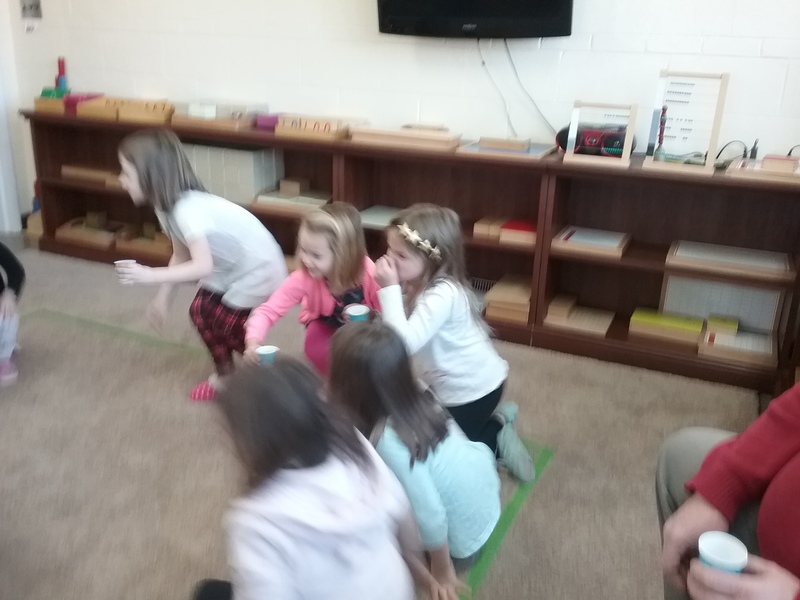 Line Time… The aim is to increase body control and concentration. 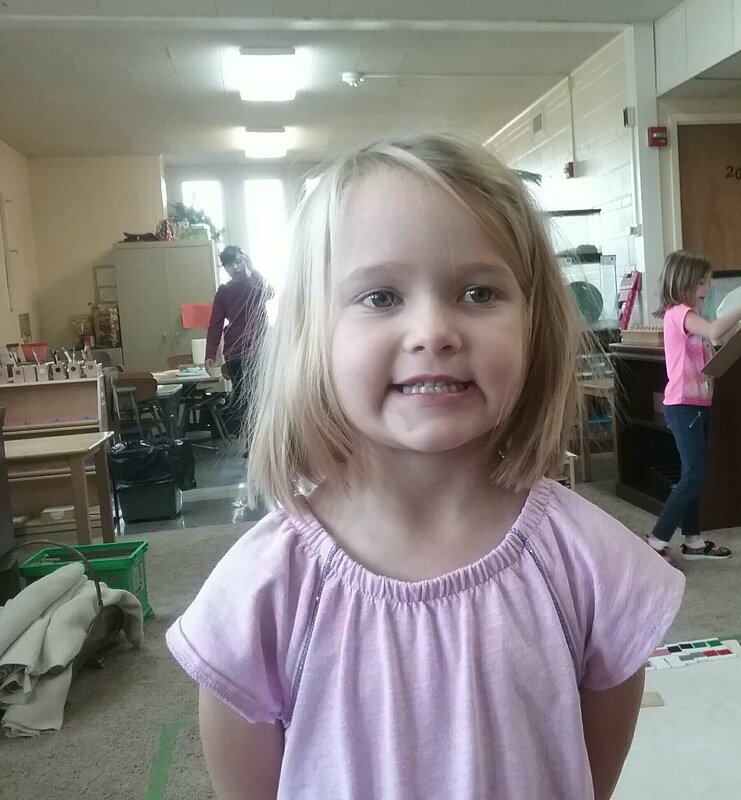 The child sits criss cross, hands to themselves, and are quiet. This is an exaggerated picture of catching a bubble (no talking), safe hands (hands to ourselves), and sitting on the line calmly. My morning line time can last up to thirty minutes and your child sit nicely for the duration of this line time. At line time I present information about days of the week, months of the year, the date, the weather, we count to ten in different languages, my weekly theme, and announcements. Also, as a bonus they get to hear my morning banter. 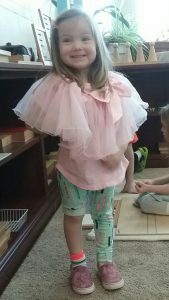 The child needs to practice, perfect, and consolidate the body’s movements. 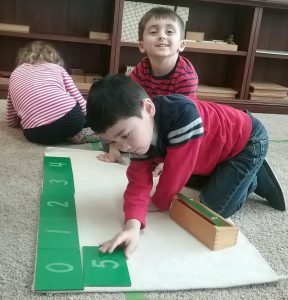 For this reason, Dr. Montessori began using the “Walking on the Line” as a Practical Life exercise. This exercise helps the child control his body, develop balance and perfect equilibrium, as well as to strengthen the mind’s control of its body’s movements. No pushing, no cutting, and no running across to the other side of the line. We play a classical piece of music, Pachelbel’s Canon in D Minor, which is exactly five minutes (4:57). After I ring the bell and the children stop, look, and listen, they proceed to clean, and walk the line. After the music ends the children sit nicely on the line. Dinosaurs and the unique things of select dinos.